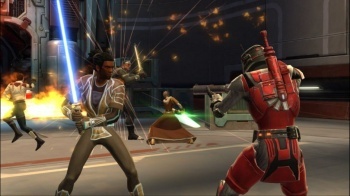 Electronic Arts' share price slid by nearly four percent today after an analyst expressed "creeping concerns" about the performance of Star Wars: The Old Republic. First things first: let's not turn this into a "The Old Republic cures cancer/shot my dog" conversation. Some people like it, some people don't and the general consensus seems to be that while it suffers from issues of various sorts, it's certainly not the ugliest MMO launch ever. Neither I nor anyone else cares what you think about The Old Republic. People do seem to care what Brean Murray, Carrett & Co. LLC analyst Todd Mitchell thinks, however, and he thinks that EA's shiny new MMO isn't quite living up to expectations. In an investor's note to clients expressing "creeping concerns" about the game, he wrote, "Specifically, initial sales appear to be below expectations, and casual observation of early play is causing us to rethink our churn assumptions." In the wake of Mitchell's note, which included a reduction in price target from $28 to $22, EA's value took a tumble. After opening at $18.23 and climbing briefly to $18.40, it fell as low as $16.85 before closing at $17.54, a loss of 3.94 percent for the day - not enough to make anyone jump out a window, but hardly cause for celebration. Sub-par performance or not, a big part of the investor/analyst uncertainty almost certainly stems from recent reports that making The Old Republic may have cost EA as much as half a billion dollars. Half a billion dollars! That's a mighty big roll of the dice, and "pretty decent" under those circumstances just isn't good enough.